Rarely can imminent shortcomings be identified in the bud and prevented if immediate action is taken. Such a reality is now emerging with regards to the threat posed by global Jihad – a threat more severe than the one posed by Palestinian terror. Until about a year ago, IDF Intelligence estimated that "Israel was not being targeted by al-Qaeda" and acted accordingly, or alternately, didn't act accordingly. Apparently, the Intelligence branch's estimate stemmed from lack of intelligence relating to such an eventuality. However, the basic assumption that a lack of intelligence regarding planned terror activities in Israel means there is in fact no such plan is perhaps apt for the Palestinian arena, where Israeli intelligence has good coverage. However, when it concerns global Jihad, a lack of such intelligence points to a shortcoming that could lead to disaster. Since these estimates were made public, reality has hit Israeli intelligence in the face. The global arena vis-à-vis Israel turned out to be rife with activity: Jihad terror in the Sinai, Jordan, missile fire towards Eilat and fire from Lebanon, along with intelligence indicating that global Jihad activists had infiltrated the Gaza Strip following disengagement, and a new global Jihad organization being established in the Palestinian arena. As if this proof of their capability close to our borders was not enough, signs of their intentions finally hit home when the heads of al-Qaeda recently announced that Israel is one of their primary targets. When there is synergy between global Jihad's capabilities and intentions, the defense establishment would be wise to show signs of concern and alert. Against the backdrop of this laconic intelligence, Israel's political leadership and the defense establishment have chosen to continue ignoring severe security failures that have enabled the infiltration of global Jihad activists into Israel without difficulty. Past experience has shown that Israel's aerial gateway – Ben Gurion Airport – was penetrable by terrorists. Since the second half of the 90s, terror activists have penetrated Israel through this gate, and several of them even carried out attacks in Israel. However, Israel's southern border, which is virtually unobstructed, should be the gateway over which defense officials lose sleep. This border, which is mostly void of any real physical obstacles and guarded by minimal military forces, is used by Bedouins almost nightly for smuggling goods and people into Israel. This security shortcoming serves as an entry point for global Jihad to penetrate Israel as well. 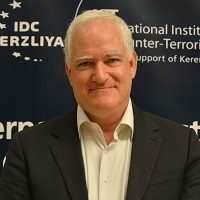 Decision makers in Israel have not comprehended yet that the fight against this threat calls for a change of perception and new modes of conduct. We have all been raised on the belief that Israel bases its security on the defense establishment and the IDF and not on any other exterior force. However, when dealing with global Jihad, we cannot rely solely on our own military and intelligence forces. Effective handling of the situation requires a network that would comprise countries and organizations fighting a common enemy. Israel would do well to consolidate such a network that would also include Muslim and Arab countries. When facing such a severe security threat, the tools of war don't necessarily have to be tanks and planes, but rather, official and covert forms of cooperation. The forces leading such a strategy don't necessarily have to be the IDF and the Shin Bet, but rather the foreign office and defense staff who would work with their counterparts overseas. Such cooperation would require adaptation of Israel's foreign policies to the international campaign against global Jihad in a way that would contribute to minimizing global Jihad's capabilities and motivation, which are at the heart of this threat.